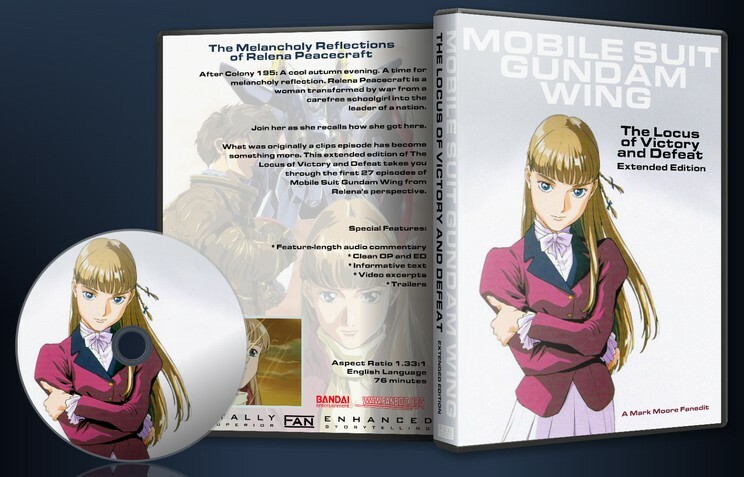 An extended edition of episode 27 of “Mobile Suit Gundam Wing” focusing entirely on Relena. To create a “feature-length film” version of episode 27 entirely from Relena’s perspective. Reave for creating cover and disc art, creating the DVD5 version. 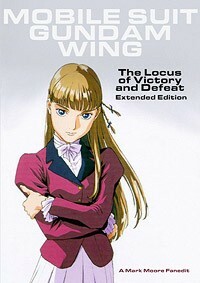 Episode 27 of “Mobile Suit Gundam Wing” is a clips episode that recaps the events of episodes 01-16. The premise (as shown by the framing sequence) is Relena is reflecting on the events as she talks to her father. However, the episode, due to being merely an episode, skips over a lot of things, and the initial premise presented by the framing sequence is destroyed by having Heero suddenly start narrating events that Relena isn’t aware of. I wanted to create a longer, deeper, more focused story by presenting all of the events that Relena (and only Relena) experienced. Think of this as a hypothetical movie that might have aired on Toonami back in 2000 prior to the series debuting (similar to “Codename: Robotech” in 1985). Watching the events from Relena’s perspective makes for a very different viewing experience compared to the series as a whole. This film is in English only. - I retained the framing sequences from episode 27 and all of Relena’s narration. - I discarded Heero’s narration and the events/people that he describes. - I discarded the episode 26 recap and the episode 28 preview. - I added all of the footage from episodes 01-16 featuring Relena (except for a brief news clip watched by Noin and Zechs). Episodes 08, 12, and 13 are not represented. - The flashback/recap footage is (mostly) taken from the original episodes. The exceptions (where I used the episode 27 footage) are Heero in the cockpit in episode 01, the meeting scene in episode 04, Relena talking after Heero flies away in episode 06, and the ominous stillness before the battle in episode 16. Please note that this results in some abrupt music changes. - I added Relena’s narration in roughly the same spots as in the original episode. - I added a piece of music from a GW soundtrack album to fill some silence in the episode 14 footage. - I typed up new closing credits. Fanedit was good, commentary was excellent.